however, took root when she made her way north to summer camp at Hameau Farm. She attended the camp for two years there, then worked as a counselor and in the barn. 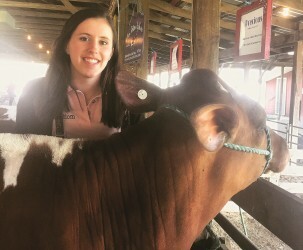 Since getting involved in showing through Hameau, Shoshana has shown Ayrshires at the All American Dairy Show, the Pennsylvania Ayrshire Association Heifer Show and Sale, the Huntingdon County Fair, and the Pennsylvania Farm Show. Shoshana is an Animal Science major at Penn State, going into her sophomore year. 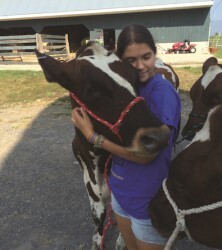 During her spring break this year, she completed a one-week internship at Palmyra Farms in Hagerstown, Maryland, where she had the chance to milk, give vaccinations, feed calves, and perform other farm chores. Though Palmyra has mainly Ayrshires, Shoshana did work with some Holsteins, Brown Swiss, and Jerseys while there. Still, her affinity for Ayrshires is stronger than ever. “Compared to the Holsteins and Jerseys that I have worked with, Ayrshires seem to have a more friendly nature and are easy to work with,” Shoshana says. Additionally, she loves the rich heritage associated with the breed, such as the fact that some bloodlines can be traced all the way back to where the breed originated in Scotland. But it’s not just the breed Shoshana love—she also thrives on the unique dynamic of the Ayrshire community. “Since there are fewer Ayrshires than other breeds, the community of people that are devoted to maintaining and improving the breed is very tight-knit and friendly,” she says. Though she is still considering several different career possibilities, such as veterinary school or working with the transition period and calving stock, Shoshana says the one thing she knows for sure is that her future will include the dairy industry. Annie’s interest in agriculture began at age 10, when she first attended summer camp at Hameau Farm in Belleville, PA, coming from her hometown of Garrett Park. After four years of summer camp at the all-Ayrshire farm, she moved on to become a camp counselor in training. As she began working more on the farm and getting involved firsthand with Ayrshires, it was easy for her to fall in love with the breed. Through her years of working with Ayrshires, Annie has developed a passion for many of the aspects that come with the territory. On the farm, she says her biggest interest is herd health—she loves treating and caring for the cattle. But another one of her duties at the farm—clipping and showing the cows—has turned into her biggest passion of all. 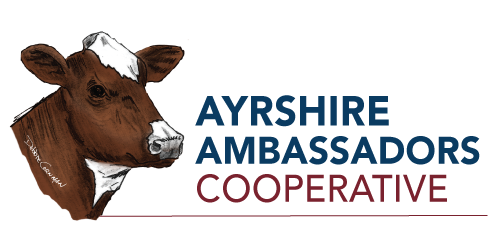 Through her showing experiences, Annie has also been able to meet and network with other members of the Ayrshire community and dairy industry, two groups that she hopes to stay a part of for years to come. 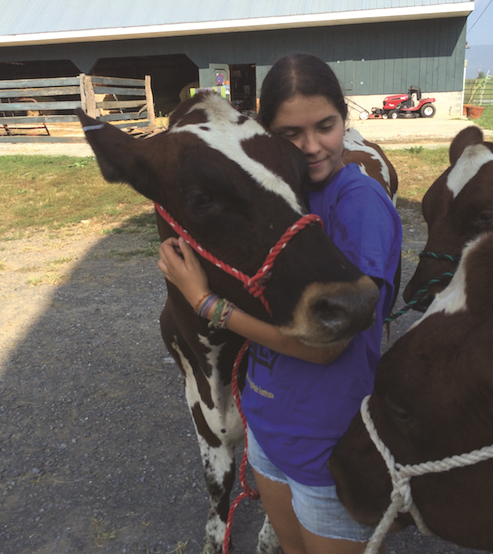 Now entering her junior year at Penn State as an Animal Science major, Annie plans to attend veterinary school and become a food animal veterinarian with a focus in dairy animals. 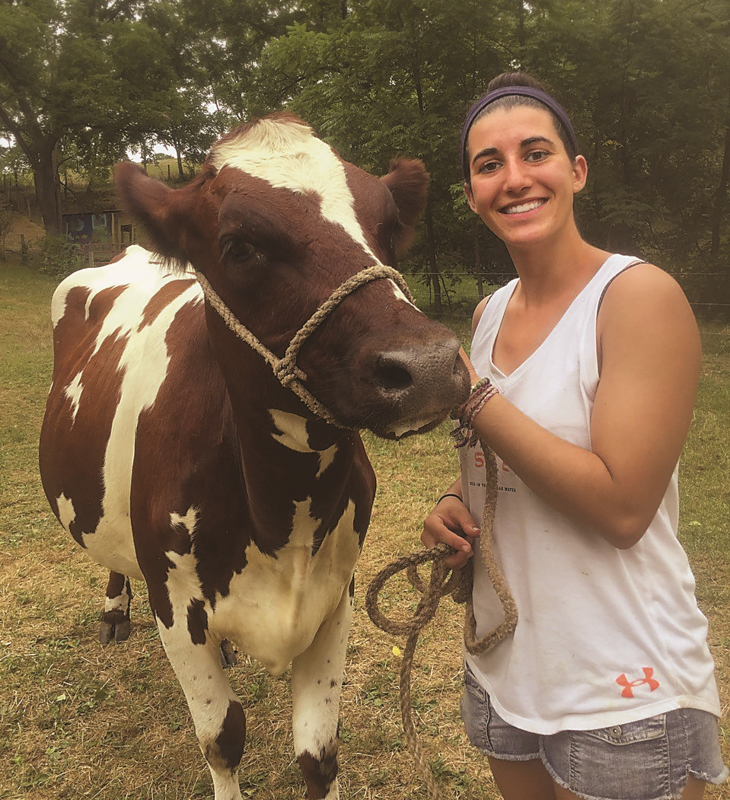 In the meantime, she keeps quite busy between working at the Penn State Dairy Barns, in a dairy nutrition research lab, and even where it all started—Hameau Farm. For the past 11 years, Amye, a native of Takoma Park, has spent her summers working with Ayrshires at Hameau Farm. Her mother initially sent her to camp there when she was younger because Amye had wanted to become a veterinarian. “Turns out, I fell in love with farming and cows,” Amye says. Wanting to work more closely with the Ayrshires, she began working in the barn and milking at Hameau, which she has now been doing for the past five or six years. She has also helped show Ayrshires for the farm. “I love Ayrshires because I think they’re smart, have personality, and are the most individual cows,” Amye says. So much so, in fact, that she says can even predict each cow’s feelings and behaviors on a certain day. The Ayrshires at Hameau seem to have an excellent memory and are able to remember her even after a year of being gone, she says. Amye has also been extremely impressed by the longevity of Ayrshires, as Hameau Farm has some 13- and 14-year-old cows that are still productive. Amye currently lives in Massachusetts, where she is entering her senior year at Hampshire College in Amherst. There, she works with the Dutch Belted breed—a small breed on the Livestock Conservancy’s critically endangered list, with less than 465 registered in the U.S. Amye is extremely passionate about preserving these kinds of smaller heritage breeds and their genetics. Although Amye is not sure of her future plans yet, she loves the idea of becoming a farmer with a diverse herd of heritage breeds like the Dutch Belted and, of course, the Ayrshire—which she says will always have a special place in her heart.